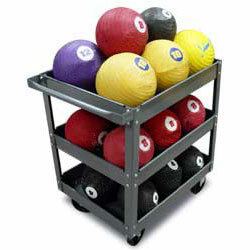 Three tier Medicine ball cart, with 18 Ball Super Medicine Ball set 4 (4 lbs), 4 (6 lbs), 4 (8 lbs), 4 (10 lbs. ), 2 (12 lbs.) and All 6 Medicine Ball Videos which includes: Dr. Chu's essential Medicine Ball Exercises, Power Golf Exercises with Dr. Don Chu and Randy Souza, Tom House's Cross Specific Baseball Training, Comprehensive Medicine Ball Training with Bob Alejo, Plyoball Training for Basketball with Al Vermeil, and Medicine Ball Conditioning for Volleyball with Daryl Kapis.